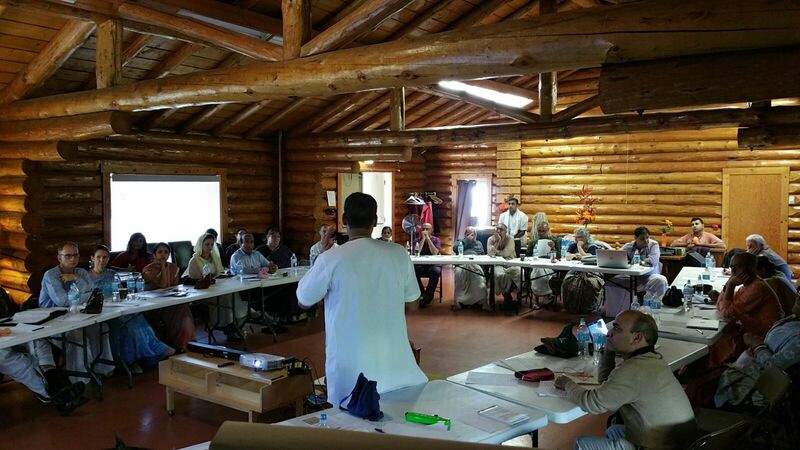 Report from the ISKCON Canadian Leaders Meetings! ~ The Toronto Hare Krishna Temple! Report from the ISKCON Canadian Leaders Meetings! Members of the ISKCON Toronto Temple Council were in beautiful Edmonton, Alberta attending the annual ISKCON Canadian Leaders Meeting. These meetings provide a chance for leaders of our Hare Krishna communities around the country to annually come together and discuss success stories, challenges and opportunities. Outreach: How Not to Blow it with Nice, New People! Throughout the weekend of enlivening meetings, live updates were posted via the Temple Council's Twitter account. We've pasted the "tweets" below so you can get a "play-by-play" report of the weekend! Leave your comments below to share feedback (especially if you like this idea of "live tweeting" events)! Also, you can get automatic text message updates from the Toronto Temple Council by sending a text message saying "Follow @templecouncil" (without the quotation marks) to 21212. Canadian Leaders Meetings this weekend in Edmonton! Trying to see if there will be cell/data reception so that we can live tweet updates! Presentation on Financial Obligations by Vrinda dd from ISKCON Winnipeg and now Strategic Planning by Aindra Prabhu from ISKCON Brampton! Presentations on Western outreach, TOVP, Fundraising Ideas, and now Devotee Care!